Unlike woods and irons, a putter's shaft may be attached to the club head at any point. Unless you hit a hole in one or sink a chip shot from off the green, you’ll use a putter on every hole of golf you play. Indeed, a typical player will putt twice (but hopefully not more often) on each green. The United States Golf Association sets the standards for all golf equipment, including putters, in the United States. The standards are found in Appendix II of the Rules of Golf. Appendix II, Section 1a of the Rules of Golf describes three different types of golf clubs: Woods, irons and putters. 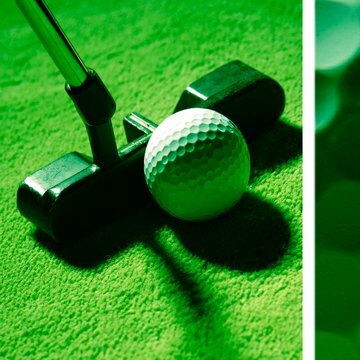 A putter is defined as “a club with a loft not exceeding ten degrees designed primarily for use on the putting green.” There is, however, nothing in the Rules that prevents a player from using a putter off of the green. Golfers frequently employ their putters from the green’s fringe when there are no obstacles between the ball and the green. All golf clubs, including putters, must be at least 18 inches long. While woods and irons are also limited to 48 inches in length, putters have no such restrictions. Putter length is measured from the top of the grip straight down the shaft to the sole of the club head. If the putter’s shaft isn’t straight, the measurement is made using a “straight line extension” of the shaft, according to Section 1c of Appendix II. The club head’s width, measured from the outermost portions of the putter's heel and the toe, cannot exceed 7 inches, according to Section 4b(iii). The club head’s height, measured from the sole to the uppermost portion of the club head, may not exceed 2.5 inches. The club head's width must be greater than its depth, measured from the face to the back of the club head. The width of the club face must be greater than or equal to half the overall club head width. The club face’s width must also be greater than or equal to two-thirds of the club head’s depth. If there are any markings on the putter’s face, they may not contain “sharp edges or raised lips,” under Section 5f. As with all clubs, the angle of a putter’s shaft relative to the ground cannot exceed 80 degrees when the club is in the address position. Additionally, the shaft’s angle at address relative to the target line cannot diverge from the vertical more than 20 degrees in the target’s direction or more than 10 degrees in the opposite direction, pursuant to Sections 1d(i) and 1d(ii). Unlike other clubs, a putter’s shaft, neck or socket “may be fixed at any point in the head,” according to Section 2c.